Give yourself a fright, and brighten up your room with this fun Super Mario Bros. Boo 3D Light. 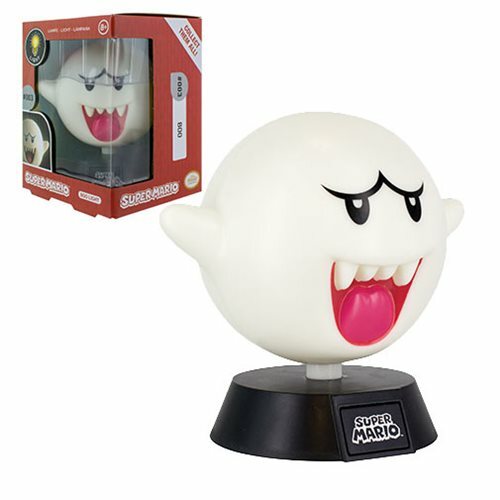 This light features Boo, one of the scarier villains from the Super Mario video games and makes a great gift for fans of the game. Lovers of the Super Mario games will remember taking on Boo many times, and now with this great piece of memorabilia you can remember all of your adventures each time you switch on your light. The Super Mario Bros. Boo 3D Light is perfect for use as a bedside lamp, or on your desk! It has three LED lights inside, and has an on/off button on the base. Requires 2x "AAA" batteries, not included. Ages 8 and up.